The creative bubble – April edition almost on! Another month, another edition of The Creative Bubble and a myriad of emerging artists showcasing their work – visual artists, spoken word and Poetry, Music & the latest addition and now regular appearance of the guys from Let The Film Do The Talking who invite you to immerse yourself in short films and augmented reality. As always, we are providing a selection of artists we feel should get some exposure just because we appreciate their work and hope you will to. We are delighted to have James Kinsella involved in this pop up show. James currently resides in Austria, yes The Creative Bubble is international (! ), who will be showing three of his screen print on acrylic paint latest work. We included below ‘Herschelgasse’ for you to see what you can expect to see on display if you come down. ‘Less is more’ is what we felt when we first saw James’ work. 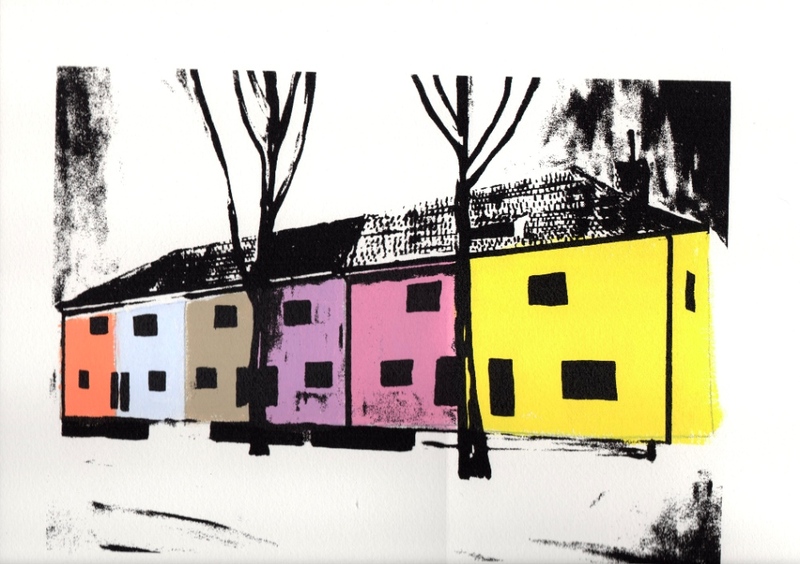 We like the “sketchy’ feel of this piece and above all the contrast between black outlines and bright and bold colours. We cannot wait to hang it up on the walls of the Roxy Bar and Screen.